Four teenagers are on the verge of exploding. The anxieties they face at every turn have nearly pushed them to the point of surrender: senseless high-stakes testing, the lingering damage of past trauma, the buried grief and guilt of tragic loss. They are desperate to cope, but no one is listening. So they will lie. They will split in two. They will turn inside out. They will even build an invisible helicopter to fly themselves far away...but nothing releases the pressure. Because, as they discover, the only way to truly escape their world is to fly right into it. The genius of acclaimed author A.S. King reaches new heights in this groundbreaking work of surrealist fiction; it will mesmerize readers with its deeply affecting exploration of how we crawl through traumatic experience-and find the way out. 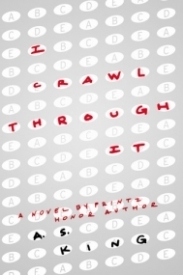 I CRAWL THROUGH IT is the weirdest book I've ever read. Period. Reminiscent of Haruki Murakami's singly unique style, King has delivered yet another standalone masterpiece. Personally, I have a hard time understanding metaphors in fiction, and I struggle with literary writing. I think this book is brilliant but I don't know quite why. There is a lot being said about an educational system based on standards and testing, and the effects that has on youth. King also has a lot to say about expectations and becoming adults, and her characters have very unique yet relatable reactions to that. The story follows 4 teens who are coming of age together in their sleepy little town where everyone knows everyone else's business. They long to escape from their own boxes and cages, and they have very strange ideas of how they're going to do so. One boy is building an invisible helicopter to fly away in. Another girl writes impressive poetry that so accurately reflects the world around her. The lives of these teens are intertwined, their actions and reactions affecting each other in nuanced ways. I couldn't stop turning the pages, to find out what happens next. A great book with a clever premise and fantastic writing that will keep readers enthralled. A.S. King is a master of literary YA fiction, and her latest novel is no exception. Metaphors and analogies, combined with skilled writing and a fascinating plot, ICTI is simply brilliant.